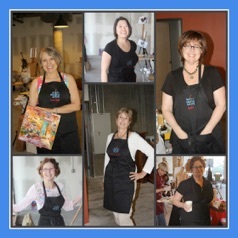 Get your own Artists Helping Artists apron with the embroidered AHA logo and your first name. Apron is all cotton with double pockets. ​Apron is available in black. You will be send an email to confirm first name for embroidery. ​Cost is $23.95 plus $4.00 shipping and handling.